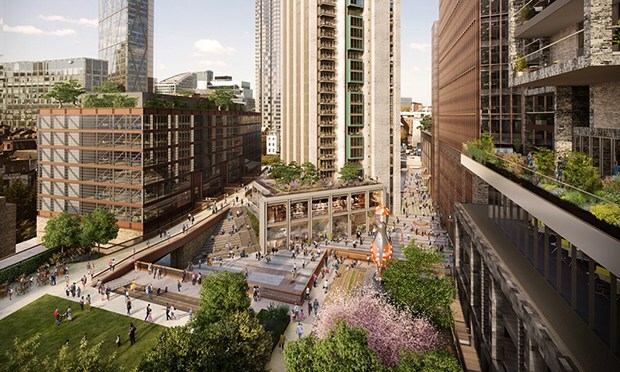 The Mayor of London Boris Johnson has been urged by his own planning officers to reject the “unacceptable” plans for Bishopsgate Goodsyard, in a boost to the long-running campaign against the development. In a new report published last Friday, the London Mayor’s staff at the Greater London Authority (GLA) found the “density, height, massing and layout” of the £800m high-rise project were “not appropriate” for the site, which straddles Shoreditch and Spitalfields. “The cumulative harm to heritage assets, the unacceptable daylight-sunlight impact, density, height, massing and layout of the scheme are considered to significantly outweigh the potential public benefits of the scheme,” the report states. The mix-use scheme has faced fierce local opposition due to its scale – it would include seven tower blocks of up to 38 and 46 storeys – and because originally only 10 per cent of the homes were ‘affordable’. A spokesperson for heritage activist group More Light More Power “welcomed” the recommended refusal of the “brutal and damaging scheme”. But certain requirements, including those relating to heritage issues and the loss of light, have still been negotiated down, the group warned. Following negotiations with City Hall, the developers agreed to up the proportion of affordable housing from 10 to 15.8 per cent. However, GLA officers recommended that if Mayor Johnson were to approve the scheme then 25 per cent of the housing within Tower Hamlets should be affordable. They also suggested the developers make another £21.8m payment in lieu of further affordable housing. Joint developers Hammerson and Ballymore say the scheme will include 1,356 new homes, 700,000 square feet of office space, five and a half acres of ‘public realm’ and create 7,000 jobs. Mayor Johnson bypassed the local authorities of Hackney and Tower Hamlets last year by ‘calling in’ the planning application, which gives him the final say on the outcome. He is due to decide whether to approve the Bishopsgate Goodsyard plans at a public hearing on Monday 18 April. London Assembly members have weighed in on the issue, urging Mayor Johnson to reject the proposals. Sian Berry, Green candidate for London Mayor and the party’s lead candidate for the London Assembly, said: “Boris Johnson called in this planning application for tower blocks of luxury apartments after both Tower Hamlets and neighbouring Hackney local authorities rejected the scheme. London Assembly Member Caroline Pidgeon, who is the Liberal Democrat candidate for London Mayor, said Mayor Johnson should “never have called in this application in the first place”. Jennette Arnold, Labour London Assembly Member for Hackney, Islington and Waltham Forest, was approached for comment and had not responded at time of publication. A spokesperson for Hackney Council, which last year publicly rejected the proposals, said: “We’re pleased that the GLA’s planning officers have recognised the many problems with the current application and the negative impact it would have on the character of Shoreditch, and the hundreds of residents and businesses nearby. The London Mayor declined to comment until after he has made the decision.